The CF2SCSI / SCSIFLASH Hot Standby Drive enables the two CompactFlash (CF) cards to work as a mirrored pair providing increased resilience and fault-tolerance. The Hot Standby Drive is available in 50-pin, 68-pin and 80-pin variants supporting 2.5 inch, 3.5 inch or larger 5.25 inch form factors and operates with CF cards of up to 512GB in capacity. Solid State Disks Ltd (SSD), the advanced storage systems design, development and integration specialist, has launched Hot Standby, a solid state, CompactFlash-based dual drive for replacing ageing and failed SCSI-based legacy electro-mechanical storage systems including hard disk, magneto optical, tape and floppy drives. Incorporating twin CompactFlash drives, Hot Standby enables the two CompactFlash (CF) cards to work as a mirrored pair providing increased resilience and fault-tolerance. The Hot Standby drive is presented to the host system as a single logical drive that will continue to operate seamlessly if either of the CF cards fails. This also allows one CF card to be removed or dismounted for backup over the Ethernet port, giving a full disk image backup without dismounting the drive. The hot standby functionality ensures that any previously paired CF card, maintains a log file of the sectors written so that it can be used to quickly re-synchronize with the removed or replaced second card to re-establish a mirrored pair. Hot Standby is ideally suited for use in process critical legacy computer systems where downtime for maintenance and backup cause major disruption and expense. These are found in a range of industries including telecommunications, semiconductor manufacturing, industrial process control, engineering and manufacturing, power generation, oil & gas, military & aerospace, flight simulation and post-production. The Hot Standby drive is available in 50-pin, 68-pin and 80-pin variants supporting 2.5 inch, 3.5 inch or larger 5.25 inch form factors and operates with CF cards of up to 512GB in capacity. Hot Standby Drive is available in 2.5" 50 pin SCSI Solid State Drive / 3.5” 50 pin Narrow SCSI Solid State Drive / 3.5” 50 pin Narrow SCSI SSD Drive / 68 pin Wide, Wide Differential, Wide LVD SCSI Solid State Drive / 80 pin Wide, Wide LVD (8bit) SCSI Solid State Drive variants. Hot Standby Drive enables the two CompactFlash (CF) cards to work as a mirrored pair providing increased resilience and fault-tolerance. Hot Standby Drive is presented to the host system as a single logical drive that will continue to operate seamlessly if either of the CF cards fails. Allows one CF card to be removed or dismounted for backup over the Ethernet port, giving a full disk image backup without dismounting the drive. The hot standby functionality ensures that any previously paired CF card, maintains a log file of the sectors written so that it can be used to quickly re-synchronize with the removed or replaced second card to re-establish a mirrored pair. Board is low power, using 5V only, and has an optional add-on display and pushbutton user interface. For full bit for bit image backups, it also includes a remote dismount feature which operates independently from the control of the host system to enable any CF card in a mirrored pair to be taken offline with the minimum of operational interruption to the host. A bit for bit image can be restored to a CF card either by inserting a backup CF card or writing to a CF card over the Ethernet port. 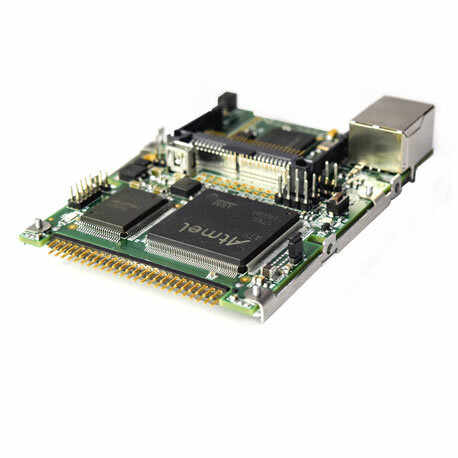 Small format PCB converts Compact Flash Media to appear as a SCSI device on a Host’s SCSI bus. 2.5” form factor PCB which will replace any 2.5” disk drive or larger drives with customised housing. Will fit in a 3.5” or customised Disk slots. SCSI Host will typically see the device as a disk drive of any emulation. 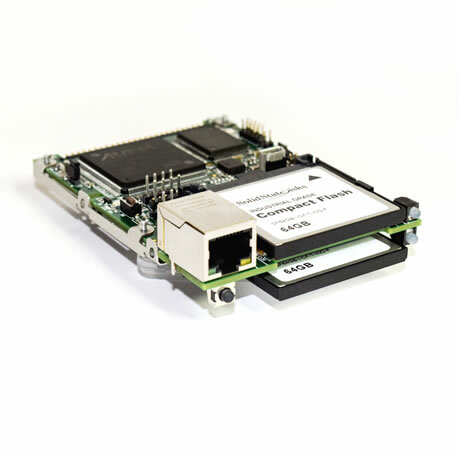 Board size: 2.5" Form factor. Compact Flash: Dual 3M header for Type 1 & 2 cards, Push button Ejector to remove CF. Power connector: Standard Disk drive type SCSI-1 and 2 Compatible. 50 pin DIL 0.1” Connector. RS232 Serial Port for microcode load and real time diagnostics.